For last week's 1st April edition of Finance Fridays we were looking at foolish ways to make a million. This week as the new financial year I fear I am the harbinger of bad news. It seems many companies find the beginning of the tax year is a good excuse to raise prices. So now is the time to check what has gone up so we can all adjust our budgets for the months ahead. Some things we can't do much about whilst others may make us rethink our plans. Let's see where those extra pounds and pennies are going to. NHS Dental Charges – If you live in England and pay for NHS dental treatment then the three bands of treatment available have gone up by an inflation busting 5% from 1st April. The basic Band 1 goes from £18.80 to £19.70. This covers examination, diagnosis, x-rays and scale and polish. Band 2 will now cost £53.90 from £51.30 if you need a filling, root canal treat or tooth removal. The upper Band 3 for more complex procedures such as crowns, dentures and bridges will be now £233.70 from £222.50. For further details of the costs and to see if you could get some help with the charges look at the NHS England website. Prescription Charges – More medical charges for those living in England as prescription charges have risen by 20p to £8.40. If you need to pay for more than three items in three months then it might be worth worth buying a Prescription prepayment certificate (PPC). Check on the NHS England website for full details. Council Tax – The funding to councils from central government have been cut and cut in the last five years but still many councils have not passed on the full amount to their residents. This year however most councils have no choice than to up their bills as a 2% Social Care levy has been imposed on them. Councils also do not set the charges will go towards police and fire services in their areas so these may increase as well. Stamp Duty on second homes – As someone from works from home then Homes Under the Hammer is usually on the TV when I'm working in the morning. If you have aspirations of being a property developer or buying a rental investment. From 1st April 2016 in England, Wales and Northern Ireland if you purchase an additional residential property to the one you live in you will need to pay an additional 3% Stamp Duty on top of the standard Stamp Duty rates. To find out how much this could cost use the HMRC calculator. Air Passenger Duty (APD) – If you fancy a getaway this year bear in mind that the further you fly now the more expensive it will be as APD has risen by the cost of inflation. The good news is that APD has been abolished for children aged 12 to 15 after being cut for the under 12s last year. If you have already booked a flight check to see if you have been charged. Some airlines are automatically refunding the tax whilst others are making customers apply for it. Postage – As an individual you may not send much mail save for occasional greetings and Christmas cards but the cost of stamps has just gone up. A first class stamp now costs 64p and second class is 55p. Remember that any books of stamps you already have with 1st or 2nd class printed on them will still be valid for the full amount even if you bought them some time ago. 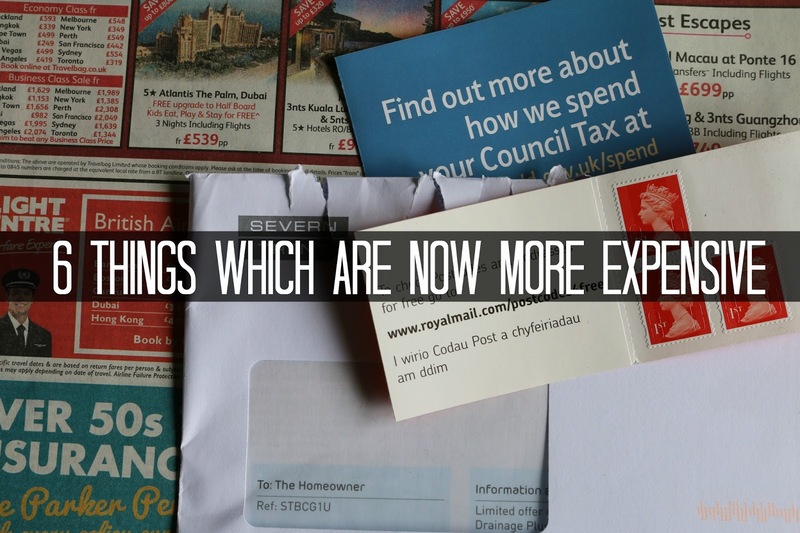 Have you been caught out by a price rise? What have you noticed going up in price? Joining us last week was Jane from Maflingo who has been trying to work out the deal for her gas and electric provider. Should you go duel fuel or keep them separate? If you want to join in with this week's Finance Fridays then add your link to the linky below. Any post concerning financial matters is allowed. Full details here. It doesn't have to be published today as you have until 23.55 on Tuesday 12th April 2016 to join in. Grab my badge below for your blog post. When I read your headline I thought 'everything is more expensive!' But also have you noticed some things also getting smaller? My loo rolls are less 'round' than they were and the washing tablets are smaller. You only notice things like this when you are re-stocking! It always seems to happen all at once, things are definitely seeming a lot more expensive! Thanks for the heads up on this. All these price rises are definitely a worry. Stamps seem to go up in price all the time - I'm sure they used to be 20p at one point! Life in general is getting more expensive isn't it! I think everything is getting more expensive and yet my husband's wages are going down because of NI changes and the like. Can't believe how expensive stamps are these days. Postage is insane! I couldn't believe it when I went to the PO last week to post some letters!